At a loss for words: I felt the same way coach…WTF is going on out there?? It was glorious while it lasted…national attention, a glimpse into what could be, a euphoria that would seem to indicate that our Pirates would buck the system and find a slice of college football heaven. On a day where the defense played damn near inspired football (allowing just 135 yards of total offense), the offense chose to reveal its dark underbelly…one we all (at least I know I did) thought was fully exorcised in the off-season. And, on a national stage in the rain at Philly, the Pirates O put on such a sub-standard performance (despite more than 400 yards) that anyone tuning in would NEVER have mistaken this team for professionals despite the look and feel presented by playing in a venue like Lincoln Financial field. 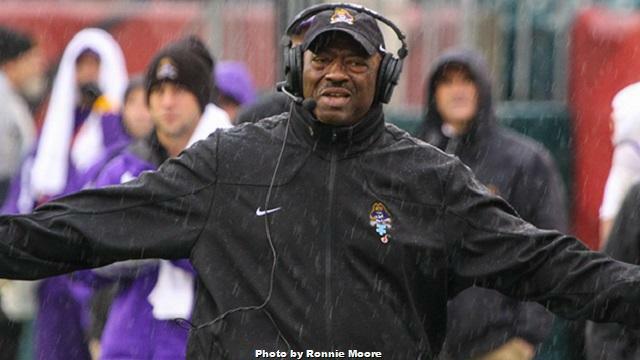 Every cutaway to Coach Ruffin McNeill showed the pained face of a man who could not believe what he was witnessing from a group of young men who had largely always found a way to get it done. I, too, felt that cringe every time the offense got the ball. For the first time in a long time, I was expecting a poor pass, a penalty, a fumble (we had 8 on the day), a dropped ball, a wrong read…rather than expecting success. Is our offense that bad? Not by a stretch. Were the conditions about as bad as they could be for an offense designed to pass the ball? Absolutely. Did the football bounce incredibly one way for the Owls? Certainly. But, alas, what I took away from this crushing defeat, was that our Pirates are really just exactly what most of us who have been watching them for a long time already knew but had convinced ourselves otherwise are. A good team. Not a great team. Maybe a team that could end up on a list somewhere among the Top-25. Maybe a team that finishes as a very good team. It is games like Temple that separate the good from the great and always will. You simply cannot come in to a game where you are a heavy favorite, with extra time to prepare, and lay a colossal egg like the Pirates did and then turn around and say you are a very good team. ECU is what we thought they were. Now, the good news is that a closer look at things would reveal that while we lost the inside track to a New Year’s Day selection bowl, ECU has not lost the opportunity to win the AAC title. Thanks to our friends in Central Florida and their equally devastating loss to UConn, the Pirates still control their own destiny in the league. Winning the AAC in their first year in is a HUGE goal that will set the stage for years to come for the Pirates and frankly would make this season more than a good one if the team can accomplish this. Other good news? Well, the national attention will quickly fade (I know, Pirates, it is back to just the local guys who have been with the team forever) which is sad, but at least with the spotlight a little cooler, the pressure should ebb a bit and maybe that will allow the Pirates to rally down the stretch. A 10-win season is in the balance as is a decent bowl game against a decent opponent. Who knows, maybe Boise or CSU falters down the stretch and the Pirates slip back in… but there is still plenty to play for. This is the type of moment where McNeill tends to thrive and where the family atmosphere he has worked so hard to build can be the salve that heals the wounds. For many teams that were under the same pressure, fissures would occur and finger-pointing would ensue. Not here, not in this program. They will pull together. And this is good, because there is no time for the Pirates to cry about the loss as they now have to head to a Thursday night game at Cincinnati where the Bearcats no doubt will expect to win against an ECU team that looked really bad in the loss in Philly. 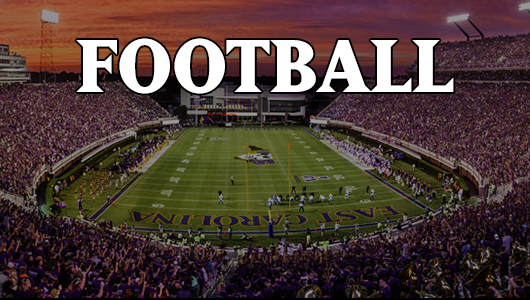 There is no margin for error now…the ECU mission is clear: Win out or accept a mediocre season. At Cincinnati, we cannot expect our defense to play as they did against Temple. The Bearcats will score, so if our offense cannot generate we will be in for an embarrassing not ala Marshall last year. I am hopeful that Ruff, Lincoln Riley, Shane Carden and Justin Hardy have analyzed what happened and that this team comes out refocused and re-energized for next Thursday night. I am betting on these kids to recapture the luster that was lost over the last few weeks. Too much left on the table to grab. The Pirates are who we thought they were and being ECU is still pretty good.